We develop complete, contemporary Scandinavian interiors for babies and children. We use our knowledge of children to create the world's best functional, playful and sustainable room solutions. All FLEXA products are designed to create a safe and stimulating environment which adapts, grows and transforms to meet children’s ongoing developmental needs. Our production facility in Europe has more than 200 dedicated and skilled employees, ensuring the highest quality children’s furniture. At our 3 European factories we produce beds and storage products in pine, birch and MDF. This ensures our contemporary and playful collections live up to our rigorous demands of non-toxic and environmentally friendly materials. 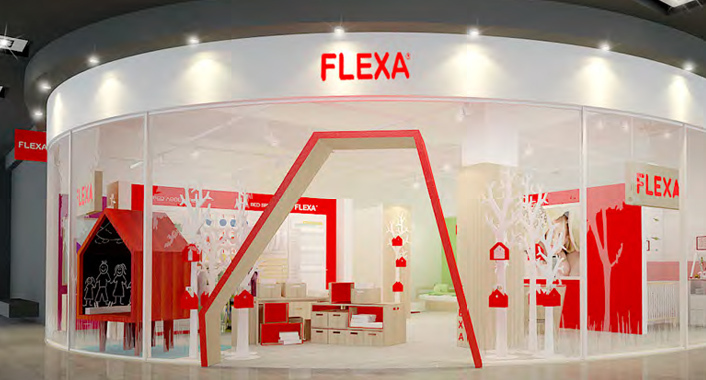 The first FLEXA store opened in 1999 in Nice, France and our retail division has since developed into the largest chain of stores dedicated to kids’ room interior solutions. Today we have more than 140 specialist stores located in Europe, Asia, North Africa and Hawaii. Everyday our dedicated and knowledgeable partners around the world guide and advice parents to design the best possible room solutions for their kids. Throughout the world FLEXA has established more than 450 studios with major furniture retailers and is widely represented in more than 1800 independent furniture stores and e-tailers.